Aromatherapy is the art and science of using and blending essential oils – concentrated plant extracts with healing properties. 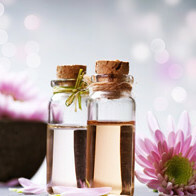 Aromatherapy massage is an alternative and complementary therapy that uses essential oils to promote healing and enhance physical, mental and emotional well-being. This holistic treatment affects some of our most powerful senses – touch and smell. The therapist will use a combination of cold pressed vegetable oils and top quality, pure essential oils to create a beautiful smelling, highly therapeutic, individualised massage experience.